On the 19 January 2014, at the Radison Blu hotel, Tripoli, the first international human rights conference following the fall of the Gadaffi regime was held by the Libyan National Council for Civil Liberties and Human Rights (NCCLHR). Attended by representatives of the Libyan General National Congress, United Nations (UNSMIL), European Union Delegation, including the EU Border Mission (EUBAM), the British Ambassador, the UAE Ambassador , Morocco, Tunisian national civil liberties organisations, the Libyan Bar, Human rights Watch (HRW), The American Bar Association (ABA), KBR, Mazars LLP, No Peace Without Justice (NPWJ), Sadat Elbadri, head Tripoli Local Council, Salam Al-Sheikhi, head of the League of Libyan Ulema, Abdul Rahman Keesah, head of the Libyan Bar Association, Libyan citizens and the national media, the conference was hailed by the NCCLHR as a success. 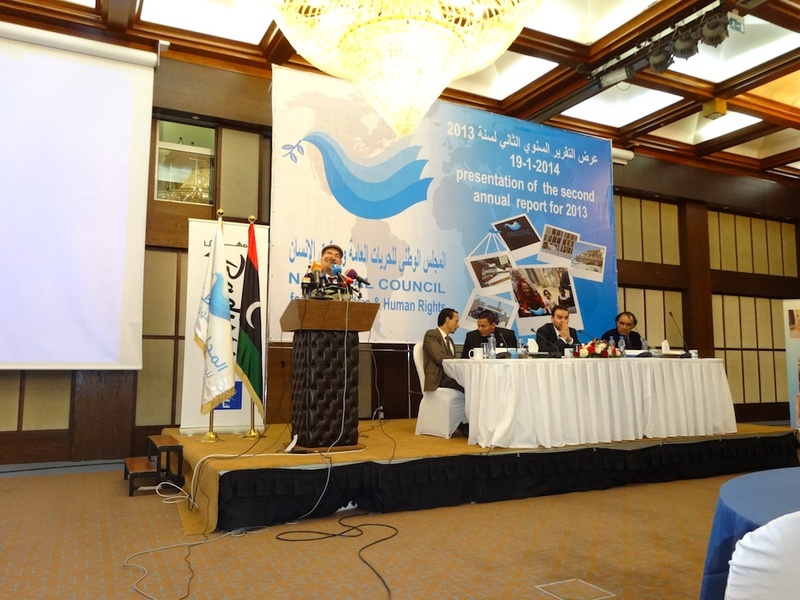 At a time of national instability, the Conference as led by the President of the NCCLHR, Mr. Mohammed Allalagi, presented its second report of 2013 detailing the strides made by the NCCLHR in independently representing the libyan people. The current condition of human rights and public liberties in Libya 2013. The National Council’s situation, difficulties and developments. Torture, cruelty and brutal treatment. Forced disappearances and arbitrary detentions. Media Status, freedom of the press and expression. In the main speech, the NCCLHR Director, Mr. Waleed Kaawan, outlined the successes of the National Council in the last six months, but was also critical of the role of the Government and Ministry of Finance. The conference also presented the NCCLHR’s “Declaration of Adoption of the UN Guiding Principles for Business and Human Rights” as drafted by 9BRi’s David Hammond and the NCCLHR lawyers. The document, a first for Libya in the area of business and human rights, provides an outline for the future intent by the NCCLHR to continue to develop their independent role as stated in the NCCLHR Strategic plan, for providing review and accountability of human rights relating to commerce throughout Libya. The UN Guiding principles, otherwise known as the “Protect, Respect and Remedy Framework” represent soft law guidance for the state, business and the individual in matters of commerce. The UN Guiding Principles were developed between 2005-2011 by Professor John Ruggie of Harvard University.